Sponsored by: The Professional Sports Psychology Group. CEU Credit: 15 Continuing Education Units for Psychologists awarded though the American Psychological Association (APA). Training Site: Boston Madison Square Garden Room, TD BankGarden, Boston, MA. Continental breakfast 8:30 am - 9:00 am. Welcome, History, & Resources 9:00 am -12:00 pm, 3.0 hrs. Working With The Athlete: What's Your Game Plan? 1:00 pm - 4:00 pm, 3.0 hrs. Mental Skills Training: Getting Your Head in the Game. 9:00 am - 12:00pm/ 3 hrs. Regulation of arousal: Making a relaxation recording. Visualization: Building on the relaxation exercise. Use of self-talk: ABC's of Building Confidence. Concentration: Test of Attention and Interpersonal Style. Exercises used to develop concentration skills. Mental Skills Training: Continued 1:00 pm - 4:00 pm/ 3.0 hrs. Integrating Sports Psychology Consultation into your Practice 9:00 am - 12:00 pm /3.0 hrs. PSPG affiliation - Sports Psychology Consultants. Where do you go from here? As evidenced from the Sports Psychology Training for Practitioners outline, participants will be exposed to a comprehensive overview of sports psychology. They will have the opportunity to develop, or in some cases augment, their skills in performance enhancement consulting. They will learn from professionals who have worked extensively in the field of sports psychology and will gain “how to” information about breaking into the field. In addition, they will also learn state-of-the-art assessments used to determine an athlete's "mental toughness.” Each participant will take the TAIS, Test of Attentional and Interpersonal Style (pre-class) and the Psychological Performance Inventory (in-class). This didactic training will also include: case discussions, videos, exercises in concentration and arousal control, and all participants who enroll in the training program will leave with a comprehensive resource book. PSPG is also working with local resources to provide an "externship" for those who wish to participate in a continued supervised experience. Our goal for the training program is for each participant to emerge with a greater awareness of the field of sports psychology and to have learned the necessary skills to begin working with athletes. PSPG will also be available on an on-going basis as a resource for continued learning and supervision. 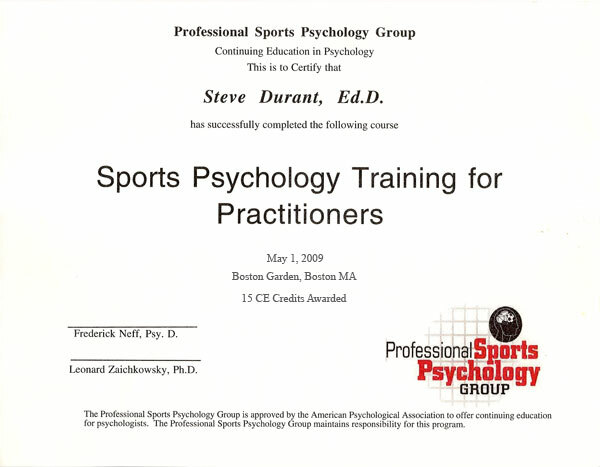 We feel that once participants complete the training program they will have the confidence and abilities to call themselves sports psychology consultants.